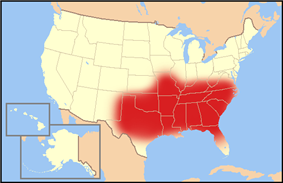 Usually, the South is defined as including the southeastern and south-central United States. The region is known for its culture and history, having developed its own customs, musical styles and cuisines that have distinguished it in some ways from the rest of the United States. The Southern ethnic heritage is diverse and includes strong European (mostly English, Irish, Scotch-Irish and Scottish), African, and some Native American components. Some other aspects of the historical and cultural development of the South have been influenced by an early support for the doctrine of states' rights, the institution of slave labor on plantations in the Lower South to an extent seen nowhere else in the United States; the presence of a large proportion of African Americans in the population; and the legacy of the Civil War and Reconstruction Era, as seen in thousands of lynchings (mostly from 1880 to 1930), the segregated system of separate schools and public facilities known as "Jim Crow", that lasted until the 1960s, and the widespread use of poll taxes and other methods to frequently deny black people of the right to vote or hold office until the 1960s. In more modern times, however, the South has become the most integrated region of the country. Since the late 1960s black people have held and currently hold many high offices, such as mayor and police chief, in many cities such as Atlanta and New Orleans. Historically, the South relied heavily on agriculture, and was highly rural until after 1945. 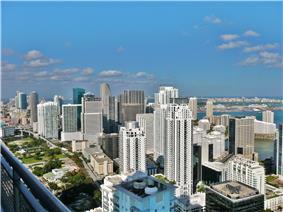 It has since become more industrialized and urban and has attracted national and international migrants. The American South is now among the fastest-growing areas in the United States. Sociological research indicates that Southern collective identity stems from political, demographic, and cultural distinctiveness from the rest of the United States. The region contains the Bible Belt, an area of high church attendance (especially in Evangelical churches such as the Southern Baptist Convention) and predominantly conservative, religion-influenced politics. Indeed, studies have shown that Southerners are more conservative than non-Southerners in several areas, including religion, morality, international relations and race relations. This is evident in both the region's religious attendance figures and in the region's usually strong support for the Republican Party in political elections since the 1960s. Apart from its climate, the living experience in the South increasingly resembles the rest of the nation. The arrival of millions of Northerners (especially in major metropolitan areas and coastal areas) and millions of Hispanics means the introduction of cultural values and social norms not rooted in Southern traditions. Observers conclude that collective identity and Southern distinctiveness are thus declining, particularly when defined against "an earlier South that was somehow more authentic, real, more unified and distinct". The process has worked both ways, however, with aspects of Southern culture spreading throughout a greater portion of the rest of the United States in a process termed "Southernization". 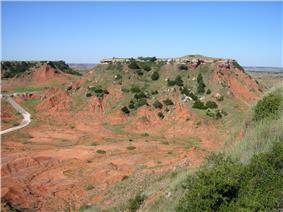 The West South Central States: Arkansas, Louisiana, Oklahoma, and Texas. Edward L. Ayers (1993). The Promise of the New South: Life after Reconstruction. Oxford University Press. Monroe Lee Billington (1975). The Political South in the 20th Century. Scribner. Earl Black and Merle Black (2002). The Rise of Southern Republicans. Belknap press. W. J. Cash (1935). The Mind of the South. New York: Vintage Books. Pete Daniel (2000). Lost Revolutions: The South in the 1950s. University of North Carolina Press. Edwards, Laura F. "Southern History as U.S. History," Journal of Southern History, 75 (Aug. 2009), 533–64. Frederickson, Kari. (2013). Cold War Dixie: Militarization and Modernization in the American South. Athens, GA: University of Georgia Press. Michael Kreyling (1998). Inventing Southern Literature. University Press of Mississippi. p. 66. Heather A. Haveman (2004). 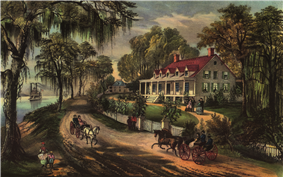 "Antebellum literary culture and the evolution of American magazines". Poetics 32: 5–28. Eugene D. Genovese (1976). Roll, Jordan, Roll: The World the Slaves Made. New York: Vintage Books. p. 41. Morris, Christopher (2009). "A More Southern Environmental History". Journal of Southern History 75 (3): 581–598. Nicol C. Rae (1994). Southern Democrats. Oxford University Press. Jeffrey A. Raffel (1998). Historical Dictionary of School Segregation and Desegregation: The American Experience. Greenwood Press. Virts, Nancy (2006). "Change in the Plantation System: American South, 1910–1945". Explorations in Economic History 43 (1): 153–176. Wells, Jonathan Daniel (2009). "The Southern Middle Class". Journal of Southern History 75 (3): 651–. C. Vann Woodward (1955). The Strange Career of Jim Crow. Oxford University Press. Gavin Wright (1996). Old South, New South: Revolutions in the Southern Economy Since the Civil War. LSU Press. James Grossman (1996). "'"Chicago and the 'Great Migration. Illinois History Teacher 3 (2). John O. Allen and Clayton E. Jewett (2004). Slavery in the South: A State-by-State History. Greenwood Press. William B. Hesseltine (1936). A History of the South, 1607–1936. Prentice-Hall. Robert W. Twyman. and David C. Roller, ed., ed. (1979). Encyclopedia of Southern History. LSU Press. Charles Reagan Wilson and William Ferris, ed., ed. (1989). Encyclopedia of Southern Culture. University of North Carolina Press. ^ a b "Regions and Divisions—2007 Economic Census". U.S. Census Bureau. Retrieved July 23, 2013. ^ Garreau, Joel (1982). The Nine Nations of North America. Avon Books. ^ Woodard, Colin (2012). American Nations: A History of the Eleven Rival Regional Cultures of North America. Penguin Books. ^ Bethune, Lawrence E. "Scots to Colonial North Carolina Before 1775". Lawrence E. Bethune's M.U.S.I.C.s Project. ^ "Gallup Poll: U.S. race relations by region; The South". November 19, 2002. ^ a b Cooper, Christopher A.; Knotts, H. Gibbs (2010). "Declining Dixie: Regional Identification in the Modern American South". Social Forces 88 (3): 1083–1101. ^ a b Rice, Tom W.; McLean, William P.; Larsen, Amy J. (2002). "Southern Distinctiveness over Time: 1972–2000". ^ "CSG Regional Offices". Council of State Governments. 2012. Retrieved February 13, 2014. ^ "south". TheFreeDictionary.com. Retrieved September 30, 2014. ^ Britton, Kerry O.; Orr, David; Sun, Jianghua (2002). "Kudzu". In Van Driesche, R. Biological Control of Invasive Plants in the Eastern United States. USDA Forest Service. FHTET-2002-04. Retrieved 2008-05-03. ^ a b c Prentice, Guy. "Native american archeology and culture history". Retrieved 2008-02-11. ^ Cook, Noble David. Born To Die, pp. 1–11. ^ Isaac, Rhys (1982). The Transformation of Virginia 1740–1790. University of North Carolina Press. pp. 22–23. ^ Wilson, David. The Southern Strategy. University of South Carolina Press. 2005. ^ "The Peculiar Institution of American Slavery". Retrieved 2008-06-11. ^ "Commentary: Lincoln's Proclamation". Retrieved September 30, 2014. 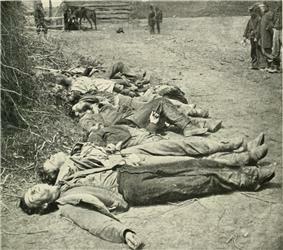 ^ "Nineteenth Century Death Tolls: American Civil War". Retrieved 2006-08-22. ^ "Chapter 3: AN EASY ADJUSTMENT TO THE POST WAR NATION: PENSACOLA BETWEEN 1865 AND 1870". fsu.edu. December 4, 2010. ^ "First Measured Century: Interview: James Gregory". Retrieved 2006-08-22. ^ "Chart: States With The Most Fortune 500 Companies". Retrieved September 30, 2014. ^ "State jobless rate below US average". The Decatur Daily. August 19, 2005. Retrieved 2007-02-12. ^ Matus, Ron, (March 6, 2005). "Schools still rank near the bottom". ^ "Graduation Rates Rise in South, Study Finds". ^ Cooper, Christopher A.; Knotts, H. Gibbs (2004). "Defining Dixie: A State-Level Measure of the Modern Political South". American Review of Politics 25: 25–39. ^ Reed, John Shelton (1982). One South: An Ethnic Approach to Regional Culture. Baton Rouge: Louisiana State University Press. p. 3. ^ a b Persons Who Reported a Single Ancestry Group for Regions, Divisions and States: 1980Table 3a. ^ a b Type of Ancestry Response for Regions, Divisions and States: 1980Table 1. ^ "Adult Obesity Facts". Overweight and Obesity. ^ a b Baird, Joel Banner (June 30, 2010). "Study: Vermont among least obese states". The Burlington Free Press (Burlington, VT). pp. 1A, 4A. Retrieved May 12, 2013. ^ "Geographic and Racial Variation in Premature Mortality in the U.S.: Analyzing the Disparities". ^ CDC. "Death in the United States". ^ Fenelon, A. (2013). "Geographic Divergence in Mortality in the United States". Population and Development Review 39 (4): 611–634. ^ Rachel Pomerance, "Most and Least Obese U.S. States", U.S. News & World Report, August 16, 2012. ^ Michael Barone, (Nov. 9, 2012) p. A13Wall Street Journal"Republicans Find Refuge in the House," . ^ "Romney Bus Tour Charts Course for Battlegrounds Obama Won". Businessweek. August 10, 2012. ^ "Tracking New Trends in Race Migration". ^ "Study shows Memphis among most integrated cities". ^ "League of the South Core Beliefs Statement". ^ James Michael Martinez et al., eds. (2000). Confederate Symbols. University Press of Florida. ^ "Table 1. Annual Estimates of the Population of Metropolitan and Micropolitan Statistical Areas: April 1, 2010 to July 1, 2012 (CBSA-EST2012-01)". 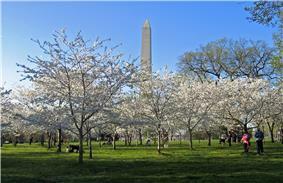 March 2013 United States Census. United States Census Bureau, Population Division. Retrieved 2014-02-19. 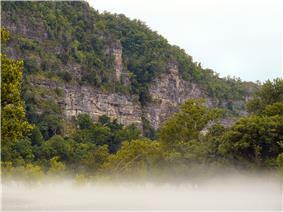 ^ The 2012 Census population estimate for the part within the South (Kentucky) is 431,997. ^ The 2010 Census population for the part within the South (Kentucky) is 973,271. * Asterisk indicates part of the metropolitan area is outside the states classified as Southern. The South was heavily rural as late as the 1940s, but now the population is increasingly concentrated in metropolitan areas. The following table shows the twenty largest metropolitan areas in the South. Other symbols of the South include the Bonnie Blue Flag, magnolia trees, and the song "Dixie". Some Southerners use the Confederate flag to identify themselves with the South, states' rights and Southern tradition. Groups, such as the League of the South, have a high regard for the secession movement of 1860, citing a desire to protect and defend Southern heritage. Numerous political battles have erupted over flying the Confederate flag over state capitols, and the naming of public buildings or highways after Confederate leaders, the prominence of certain statues, and the everyday display of Confederate insignia. While this "Confederate Flag" pattern is the one most often thought of as the "Confederate Flag" today, it was actually just one of many used by the Confederate armed forces. Variations of this design served as the Battle Flag of the Armies of Northern Virginia and Tennessee, and as the Confederate Naval Jack. 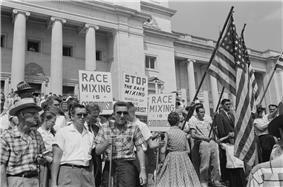 The Civil Rights Movement ended Jim Crow laws across the South. A second migration appears to be underway, with African Americans from the North moving to the South in record numbers. While race relations are still a contentious issue in the South, the region surpasses the rest of the country in many areas of integration and racial equality. According to 2003 report by researchers at the University of Wisconsin–Milwaukee, Virginia Beach, Charlotte, Nashville-Davidson, and Jacksonville were the four most integrated of the nation's fifty largest cities, with Memphis at number six. Southern states tend to have a low disparity in incarceration rates between blacks and whites relative to the rest of the country. The migration also empowered the growing Civil Rights Movement. While the movement existed in all parts of the United States, its focus was against disfranchisement and the Jim Crow laws in the South. Most of the major events in the movement occurred in the South, including the Ebenezer Baptist Church is located in the Sweet Auburn district as is the King Center, location of Martin Luther and Coretta Scott King's gravesites. The Great Migration began during World War I, hitting its high point during World War II. During this migration, blacks left the South to find work in Northern factories and other sectors of the economy. Native Americans had lived in the south for nearly 12,000 years. They were defeated by settlers in a series of wars ending in the War of 1812 and the Seminole Wars, and most were removed west to Indian Territory (now Oklahoma and Kansas). However large numbers of Native Americans managed to stay behind by blending into the surrounding society. This was especially true of the wives of Euro-American merchants and miners. The Republicans candidates for President have won the South in elections since 1972, except for 1976. However, the region is not entirely monolithic, and every successful Democratic candidate since 1976 has claimed at least three Southern states. Barack Obama won Florida, Maryland, Delaware, North Carolina, and Virginia in 2008 but did not repeat his victory in North Carolina during his 2012 reelection campaign. In 1994 mid-term elections, another Southern politician, Newt Gingrich, led the Republican Revolution, ushered in 12 years of GOP control of the House. Gingrich became Speaker of the United States House of Representatives in 1995 and served until his resignation in 1999. Tom DeLay was the most powerful Republican leader in Congress until he was indicted under criminal charges in 2005 and was forced to step aside by Republican rules. Apart from Bob Dole of Kansas (1985–96), the recent Republican Senate leaders have been Southerners: Howard Baker (1981–85) of Tennessee, Trent Lott (1996–2003) of Mississippi, Bill Frist (2003–2006) of Tennessee, and Mitch McConnell (2007–present) of Kentucky. In the American Independent Party ticket. Wallace ran a "law and order" campaign similar to that of Republican candidate, Richard Nixon. Nixon's Southern Strategy of gaining electoral votes downplayed race issues and focused on culturally conservative values, such as family issues, patriotism, and cultural issues that appealed to Southern Baptists. The South has produced various nationally-known politicians and political movements. In 1948, a group of Democratic congressmen, led by Governor Strom Thurmond of South Carolina, split from the Democrats in reaction to an anti-segregation speech given by Minneapolis mayor and future senator Hubert Humphrey of Minnesota. They founded the States Rights Democratic or Dixiecrat Party. During that year's Presidential election, the party ran Thurmond as its candidate, but he finally lost the election. 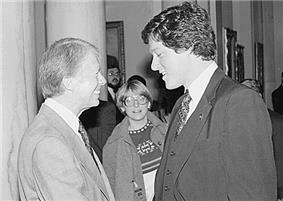 Bill Clinton, newly elected Governor of Arkansas speaks with Jimmy Carter in 1978. Both presidents are Southern Democrats. After the 2012 elections, the 11 states of the former Confederacy were represented by 98 Republicans, 24 white Democrats and 16 black Democrats. National Republicans such as Sonny Perdue taking the governorship in 2002. In addition to its middle class and business base, Republicans cultivated the religious right and attracted strong majorities from the evangelical or Fundamentalist vote, mostly Southern Baptists, which had not been a distinct political force prior to 1980. 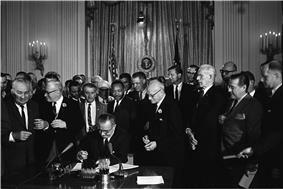 The northern Democrats' support of civil rights issues culminated when Democratic President Lyndon B. Johnson signed into law the Civil Rights Act of 1964 and the Voting Rights Act of 1965, which ended legal segregation and provided federal enforcement of voting rights for blacks. In the presidential election of 1964, Barry Goldwater's only electoral victories outside his home state of Arizona were in the states of the Deep South where few blacks could vote before the 1965 Voting Rights Act. Increasing support for civil rights legislation by the national Democratic Party beginning in 1948 caused segregationist Southern Democrats to nominate blue-collar electorate. By the 1940s the Supreme Court began to find disfranchisement such as the "grandfather clause" and the white primary to be unconstitutional. Southern legislatures quickly passed other measures to keep blacks disfranchised, even after suffrage was extended more widely to poor whites. Because white Democrats controlled all the Southern seats in Congress they had outsize power in Congress and could sidetrack or filibuster efforts by Northerners to pass legislation against lynching, for example. The region became known as the Solid South. The Republicans controlled parts of the Appalachian Mountains and competed for power in the Border States. From the late 1870s to the 1960s, only rarely was a state or national Southern politician a Republican, apart from a few Appalachian mountain districts. In the first decades after Reconstruction, when white Democrats regained power in the state legislatures, they began to make voter registration more complicated, to reduce black voting. With a combination of intimidation, fraud and violence by paramilitary groups, they turned Republicans out of office and suppressed black voting. From 1890 to 1908, ten of eleven states ratified new constitutions or amendments that effectively disenfranchised most black voters and many poor white voters. This disfranchisement persisted for six decades into the 20th century, depriving blacks and poor whites of all political representation. Because they could not vote, they could not sit on juries. They had no one to represent their interests, resulting in state legislatures consistently underfunding programs and services, such as schools, for blacks and poor whites. The South had a significantly higher rate of hospital discharges in 2005 than other regions of the United States, but the rate had declined to be closer to the overall national rate by 2011. The South has a higher percentage of obese people and diabetics. It has the largest number of people dying from stroke. The South has the highest rates of cognitive decline. Nine Southern states have obesity rates over 30% of the population, the highest in the country: Mississippi, Louisiana, West Virginia, Alabama, Oklahoma, Arkansas, South Carolina, Kentucky, and Texas. Rates for hypertension and diabetes for these states are also the highest in the nation. A study reported that six Southern states have the worse incidence of sleep disturbances in the nation, attributing the disturbances to high rates of obesity and smoking. Life expectancy is lower and death rates higher in the South than in the other regions of the country for all racial groups This disparity reflects substantial divergence between the South and other regions since the middle of the 20th Century. A number of sports are popular in the Southern U.S., but American football is the most popular. The following table shows the most popular sports teams based in the Southern U.S., ranked by average attendance. All of the top attended teams in the Southern U.S. are American football teams. The South has been seen largely as a stronghold of Protestant Christianity. Although the traditional Southerner was Anglican, or more accurately Episcopalian, the predominant denominations in the South are now Baptists (especially the Southern Baptist Convention), followed by Methodists, with other denominations found throughout the region. Roman Catholics historically were concentrated in Maryland, Louisiana, and Hispanic areas such as South Texas and South Florida and along the Gulf Coast. The great majority of black Southerners are Baptist or Methodist. Statistics show that Southern states have the highest religious attendance figures of any region in the United States. In previous censuses, the largest ancestry group identified by Southerners was English or mostly English, with 19,618,370 self-reporting "English" as an ancestry on the 1980 census, followed by 12,709,872 listing "Irish" and 11,054,127 "Afro-American". Almost a third of all Americans who claim English ancestry can be found in the American South, and over a quarter of all Southerners claim English descent as well. The South also continues to have the highest percentage of African Americans in the country, predominantely due to historical and economic factors. The predominant culture of the South has its origins with the settlement of the region by large groups of Northern English, Scots lowlanders and Ulster-Scots (later called the Scotch-Irish) who settled in Appalachia and the Piedmont in the 18th century, and from parts of southern England such as East Anglia, Kent and the West Country in the 17th century, and the many African slaves who were part of the Southern economy. African-American descendants of the slaves brought into the South compose the United States' second-largest racial minority, accounting for 12.1 percent of the total population according to the 2000 census. Despite Jim Crow era outflow to the North, the majority of the black population remains concentrated in the Southern states, and has heavily contributed to the cultural blend (Christianity, foods, art, music (see spiritual, blues, jazz and rock and roll)) that characterize Southern culture today. Overall, the South has had lower percentages of high school graduates, lower housing values, lower household incomes, and lower cost of living than the rest of the United States. These factors, combined with the fact that Southerners have continued to maintain strong loyalty to family ties, has led some sociologists to label white Southerners a "quasi-ethnic regional group". Several Southern states (Maryland, Virginia, North Carolina, South Carolina, and Georgia) were English Colonies that sent delegates to sign the Declaration of Independence and then fought against the government along with the Northern Colonists during the Revolutionary War. The basis for much Southern culture derives from the pride in these states being among the 13 original colonies, and from the fact that much of the population of the South has strong ancestral links to Colonists who emigrated west. Southern manners and customs reflect the relationship with England and Africa that was held by the early population, with some influences being provided by the Native American populations of the area. Southern public schools in the past ranked in the lower half of some national surveys. When allowance for race is considered, a 2007 US Government list of test scores often shows white fourth and eighth graders performing better than average for reading and math; while black fourth and eighth graders also performed better than average. This comparison does not hold across the board. Mississippi scores lower than average no matter how the statistics are compared. However, newer data suggests that education in the south is on par with the nation, with 72% of high schoolers graduating compared to 73% nationwide. This economic expansion has enabled parts of the South to report some of the lowest unemployment rates in the United States. But in the U.S. top ten of poorest big cities, the South is represented in the rankings by two cities: Miami, Florida and Memphis, Tennessee. In 2011, nine out of ten poorest states were in the South. Many corporations are headquartered in Atlanta and its surrounding area, such as The Coca-Cola Company, Delta Air Lines, and The Home Depot, and also to many cable television networks, such as the Turner Broadcasting System (CNN, TBS, TNT, Turner South, Cartoon Network), and The Weather Channel. In recent years some southern states, notably Texas, have lured companies with lower tax burdens and lower cost of living for their workforce. Today, the states with the most Fortune 500 companies include California, New York, and Texas; closely mirroring the economic and population resources of those states. Many major banking corporations have headquarters in the region. Bank of America is in Charlotte, North Carolina. Wachovia was headquartered there before its purchase by Wells Fargo. Regions Financial Corporation is in Birmingham, as is AmSouth Bancorporation, and BBVA Compass. SunTrust Banks is located in Atlanta as is the district headquarters of the Federal Reserve Bank of Atlanta. BB&T is headquartered in Winston-Salem. In medicine, the Texas Medical Center in Houston has achieved international recognition in education, research, and patient care, especially in the fields of heart disease, cancer, and rehabilitation. In 1994 the Texas Medical Center was the largest medical center in the world including fourteen hospitals, two medical schools, four colleges of nursing, and six university systems. The University of Texas M.D. Anderson Cancer Center is consistently ranked the #1 cancer research and treatment center in the United States. The two largest research parks in the country are located in the South: Research Triangle Park in North Carolina (the world's largest) and the Cummings Research Park in Huntsville, Alabama (the world's fourth largest). Numerous new automobile production plants have opened in the region, or are soon to open, such as Volkswagen Chattanooga Assembly Plant in Tennessee. In the late 20th century, the South changed dramatically. It saw a boom in its service economy, manufacturing base, high technology industries, and the financial sector. 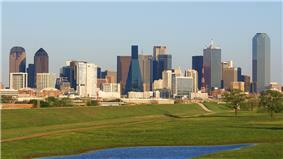 Texas in particular witnessed dramatic growth and population change with the dominance of the energy industry. Tourism in Florida and along the Gulf Coast grew steadily throughout the last decades of the 20th century. The South produced nine of the first 12 U.S. Presidents prior to the Civil War. For more than a century after the Civil War, no Southerner became President unless he either moved North (like New England. This growth increased in the 1960s and greatly accelerated into the 1980s and 1990s. 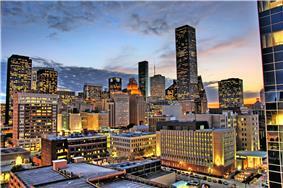 Large urban areas with over 4 million people rose in Texas, Georgia, and Florida. Rapid expansion in industries such as autos, telecommunications, textiles, technology, banking, and aviation gave some states in the South an industrial strength to rival large states elsewhere in the country. By the 2000 census, the South (along with the West) was leading the nation in population growth. However, with this growth has come long commute times and air pollution problems in cities such as Dallas, Houston, Atlanta, Austin, Charlotte, and others that rely on sprawling development and highway networks. 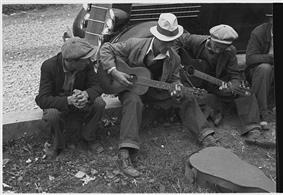 Later, the Southern economy was dealt additional blows by the Great Depression and the Dust Bowl. After the Wall Street Crash of 1929, the economy suffered significant reversals and millions were left unemployed. Beginning in 1934 and lasting until 1939, an ecological disaster of severe wind and drought caused an exodus from Texas and Arkansas, the Oklahoma Panhandle region and the surrounding plains, in which over 500,000 Americans were homeless, hungry and jobless. Thousands left the region forever to seek economic opportunities along the West Coast. In the late 19th century, Texas rapidly expanded its railroad network, creating a network of cities connected on a radial plan and linked to the port of Galveston. It was the first statein which urban and economic development proceeded independently of rivers, the primary transportation network of the past. A reflection of increasing industry were strikes and labor unrest: "in 1885 Texas ranked ninth among forty states in number of workers involved in strikes (4,000); for the six-year period it ranked fifteenth. Seventy-five of the 100 strikes, chiefly interstate strikes of telegraphers and railway workers, occurred in the year 1886." From 1890 to 1908, 10 of the 11 states passed disfranchising constitutions or amendments that introduced voter registration barriers—such as poll taxes, residency requirements and literacy tests—that were hard for many poor to meet. Most African Americans, Mexican Americans, and tens of thousands of poor whites were disfranchised, losing the vote for decades. In some states, grandfather clauses temporarily exempted white illiterates from literacy tests. The numbers of voters dropped drastically throughout the South as a result. This can be seen on the feature "Turnout in Presidential and Midterm Elections" at the University of Texas Politics: Barriers to Voting. Alabama, which had established universal white suffrage in 1819 when it became a state, also substantially reduced voting by poor whites. 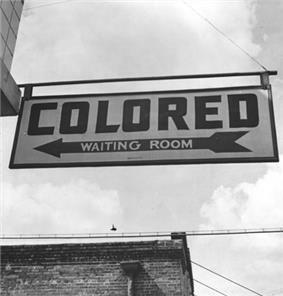 Legislatures passed Jim Crow laws to segregate public facilities and services, including transportation. Migrations continued in the late 19th and early 20th centuries among both blacks and whites. In the last two decades of the 19th century about 141,000 blacks left the South, and more after 1900, totaling a loss of 537,000. After that the movement increased in what became known as the Great Migration from 1910–1940, and the Second Great Migration through 1970. Even more whites left the South, some going to California for opportunities and others heading to Northern industrial cities after 1900. Between 1880 and 1910, the loss of whites totaled 1,243,000. Five million more left between 1940 and 1970. Northerners came south to participate in politics and business. Some were representatives of the Freedmen's Bureau and other agencies of Reconstruction; some were humanitarians with the intent to help black people. Some were adventurers who hoped to benefit themselves by questionable methods. They were all condemned with the pejorative term of carpetbagger. Some Southerners also took advantage of the disrupted environment and made money off various schemes, including bonds and financing for railroads. There were thousands of people on the move, as African Americans tried to reunite families separated by slaves sales, and sometimes migrated for better opportunities in towns or other states. Other freed people moved from plantation areas to cities or towns for a chance to get different jobs and out from under white control. At the same time, whites returned from refuges to reclaim plantations or town dwellings. In some areas, many whites returned to the land to farm for a while. Some freedpeople left the South altogether for states such as Ohio and Indiana, and later, Kansas. Thousands of others joined the migration to new opportunities in the Mississippi and Arkansas Delta bottomlands and Texas. After the Civil War, the South was devastated in terms of population, infrastructure and economy. Because of states' reluctance to grant voting rights to freedmen, Congress instituted Reconstruction governments. It established military districts and governors to rule over the South until new governments could be established. Many white Southerners who had actively supported the Confederacy were temporarily disfranchised. Rebuilding was difficult as people grappled with the effects of a new labor economy of a free market in the midst of a widespread agricultural depression. In addition, what limited infrastructure the South had was mostly destroyed by the war. At the same time, the North was rapidly industrializing. To avoid the social effects of the war, most of the Southern states initially passed black codes. Eventually, these were mostly legally nullified by federal law and anti-Confederate legislatures, which persisted for a short time during Reconstruction. The Confederate cause was hopeless by the time Atlanta fell and Reconstruction Era. The Confederacy had the resources for a short war, but was unable to finance or supply a longer war. It reversed the traditional low-tariff policy of the South by imposing a new 15% tax on all imports from the Union. The Union blockade stopped most commerce from entering the South, and smugglers avoided the tax, so the Confederate tariff produced too little revenue to finance the war. Inflated currency was the solution, but that created distrust of the Richmond government. Because of low investment in railroads, the Southern transportation system depended primarily on river and coastal traffic by boat; both were shut down by the Union Navy. The small railroad system virtually collapsed, so that by 1864 internal travel was so difficult that the Confederate economy was crippled. In the four years of war 1861–65 the South was the primary battleground, with all but two of the major battles taking place on Southern soil. Union forces relentlessly squeezed the Confederacy, controlling the border states in 1861, the Tennessee River, the Cumberland River and New Orleans in 1862, and the Mississippi River in 1863. In the East, however, the Confederate Army under Robert E. Lee beat off attack after attack in its defense of their capital at Richmond. But when Lee tried to move north, he was repulsed (and nearly captured) at Sharpsburg (1862) and Gettysburg (1863). By 1856, the South had lost control of Congress, and was no longer able to silence calls for an end to slavery—which came mostly from the more populated, free states of the North. The Republican Party, founded in 1854, pledged to stop the spread of slavery beyond those states where it already existed. After Abraham Lincoln was elected the first Republican president in 1860, seven cotton states declared their secession and formed the Confederate States of America before Lincoln was inaugurated. The United States government, both outgoing and incoming, refused to recognize the Confederacy, and when the new Confederate President Jefferson Davis ordered his troops to open fire on Fort Sumter in April 1861, there was an overwhelming demand, North and South, for war. Only the state of Kentucky attempted to remain neutral, and it could only do so briefly. When Lincoln called for troops to suppress what he referred to as "combinations too powerful to be suppressed by the ordinary" judicial or martial means, four more states decided to secede and join the Confederacy (which then moved its capital to Richmond, Virginia). Although the Confederacy had large supplies of captured munitions and many volunteers, it was slower than the Union in dealing with the border states. By March 1862, the Union largely controlled Maryland, West Virginia, Kentucky and Missouri, had shut down all commercial traffic from all Confederate ports, had prevented European recognition of the Confederate government, and was poised to seize New Orleans. Historic Southern United States. 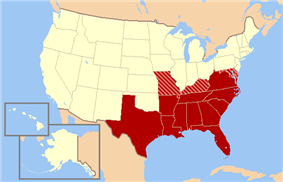 The states in red were in the Confederacy and have historically been regarded as forming "the South". Those in stripes were considered "border states", and gave varying degrees of support to the Southern cause although they remained in the Union. (This image depicts the original, trans-Allegheny borders of Virginia, and so does not show West Virginia separately. 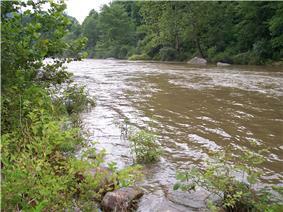 See the images above for post-1863 Virginia and West Virginia borders.) Although Oklahoma was aligned with the Confederacy, it is not shaded because at the time the region was Indian Territory, not a state. Before the Civil War, the number of immigrants arriving at Southern ports began to increase, although the North continued to receive the most immigrants. Hugenots were among the first settlers in Charleston, along with the largest number of Hasidic Jews outside of New York City. 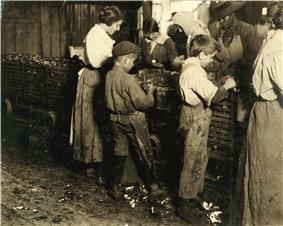 Numerous Irish immigrants settled in New Orleans, establishing a distinct ethnic enclave now known as the Irish Channel. Germans also went to New Orleans and its environs, resulting in a large area north of the city (along the Mississippi) becoming known as the German Coast; however, still greater numbers immigrated to Texas (especially after 1848), where many bought land and were farmers. Many more German immigrants arrived in Texas after the Civil War, where they created the brewing industry in Houston and elsewhere, became grocers in numerous cities, and also established wide areas of farming. Two major political issues that festered in the first half of the 19th century caused political alignment along sectional lines, strengthened the identities of North and South as distinct regions with certain strongly opposed interests, and fed the arguments over states' rights that culminated in secession and the Civil War. One of these issues concerned the protective tariffs enacted to assist the growth of the manufacturing sector, primarily in the North. In 1832, in resistance to federal legislation increasing tariffs, South Carolina passed an ordinance of nullification, a procedure in which a state would, in effect, repeal a Federal law. Soon a naval flotilla was sent to Charleston harbor, and the threat of landing ground troops was used to compel the collection of tariffs. A compromise was reached by which the tariffs would be gradually reduced, but the underlying argument over states' rights continued to escalate in the following decades. With the opening up of frontier lands after the government forced most Native Americans to move west of the Mississippi, there was a major migration of both whites and blacks to those territories. From the 1820s through the 1850s, more than one million enslaved Africans were transported to the Deep South in forced migration, two-thirds of them by slave traders and the others by masters who moved there. 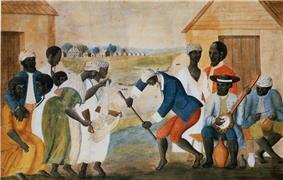 Planters in the Upper South sold slaves excess to their needs as they shifted from tobacco to mixed agriculture. Many enslaved families were broken up, as planters preferred mostly strong males for field work. The Revolution provided a shock to slavery in the South. Thousands of slaves took advantage of wartime disruption to find their own freedom, catalyzed by the British Governor Dunmore of Virginia's promise of freedom for service. Many others were removed by Loyalist owners and became slaves elsewhere in the Empire. Between 1770 and 1790, there was a sharp decline in the percentage of blacks – from 61% percent to 44% in South Carolina and from 45% to 36% in Georgia. In 1780–81, the British largely halted reconquest of the northern states, and concentrated on the south, where they were told there was a large Loyalist population ready to leap to arms once the royal forces arrived. The British took control of Savannah and Charleston, capturing a large American army in the process, and set up a network of bases inland. There were many more Loyalists in the South than in the North, but they were concentrated in larger coastal cities and were not great enough in number to overcome the revolutionaries. 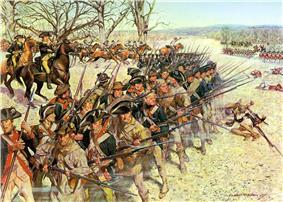 Large numbers of loyalists from South Carolina fought for the British in the Battle of Camden. The British forces at the Battle of Monck's Corner and the Battle of Lenud's Ferry consisted entirely of Loyalists with the exception of the commanding officer (Banastre Tarleton). Both white and black Loyalists fought for the British at the Battle of Kemp's Landing in Virginia. Led by Nathanael Greene and other generals, the Americans engaged in Fabian tactics designed to wear down the British invasion force, and to neutralize its strong points one by one. 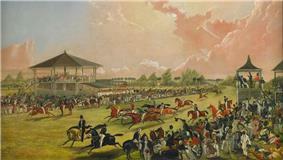 There were numerous battles large and small, with each side claiming some victories. By 1781, however, British General Cornwallis moved north to Virginia, where an approaching army forced him to fortify and await rescue by the British Navy. The British Navy did arrive, but so did a stronger French fleet, and Cornwallis was trapped. American and French armies, led by Washington, forced Cornwallis to surrender his entire army in Yorktown, Virginia in October 1781, effectively winning the North American part of the war. With Virginia in the lead, the Southern colonies embraced the Thomas Jefferson. The oldest university in the South, the University of Georgia (1785). The early colonists engaged in warfare, trade, and cultural exchanges. Those living in the backcountry were more likely to encounter Creek Indians, Cherokee, and Choctaws and other regional native groups. In the mid-to-late-18th century, large groups of Ulster Scots (later called the Scotch-Irish) and people from the Anglo-Scottish border region immigrated and settled in the back country of Appalachia and the Piedmont. They were the largest group of non-English immigrants from the British Isles before the American Revolution. In the 1980 Census, 34% of Southerners reported that they were of English ancestry; English was the largest reported European ancestry in every Southern state by a large margin. In the British colonies, immigration began in 1607 and continued until the outbreak of the Revolution in 1775. Settlers cleared land, built houses and outbuildings, and on their own farms. 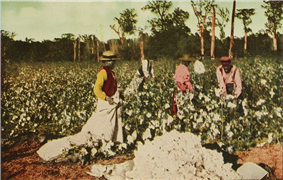 The rich owned large plantations that dominated export agriculture and used black slaves. Many were involved in the labor-intensive cultivation of tobacco, the first cash crop of Virginia. Tobacco exhausted the soil quickly, requiring that farmers regularly clear new fields. 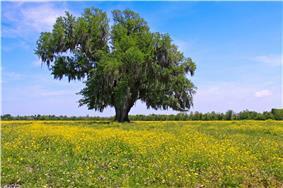 They used old fields as pasture, and for crops such as corn and wheat, or allowed them to grow into woodlots. The Spanish and French established colonies in Florida, Texas and Louisiana. The Spanish colonized Florida in the 16th century, with their communities reaching a peak in the late 17th century. The predominant culture of the South was rooted in the settlement of the region by British colonists. In the 17th century, most voluntary immigrants were of English origins who settled chiefly along the coastal regions of the Eastern seaboard but had pushed as far inland as the Appalachian Mountains by the 18th century. The majority of early English settlers were indentured servants, who gained freedom after enough work to pay off their passage. 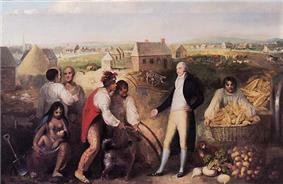 The wealthier men who paid their way received land grants known as headrights, to encourage settlement. Other peoples whose ancestral links to the Mississippian culture are less clear but were clearly in the region before the European incursion include the Catawba and the Powhatan. Native American descendants of the mound-builders include Alabama, Apalachee, Caddo, Cherokee, Chickasaw, Choctaw, Creek, Guale, Hitchiti, Houma, and Seminole peoples, all of whom still reside in the South. The first well-dated evidence of human occupation in the south United States occurs around 9500 BC with the appearance of the earliest documented Americans, who are now referred to as Paleo-Indians. Paleoindians were hunter-gathers that roamed in bands and frequently hunted megafauna. Several cultural stages, such as Archaic (ca. 8000-1000 BC) and the Woodland (ca. 1000 BC - AD 1000), preceded what the Europeans found at the end of the 15th century—the Mississippian culture. 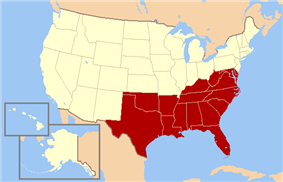 The popular definition of the "South" is more informal and generally associated with the 11 states that seceded during the Civil War to form the Confederate States of America. Those states share commonalities of history and culture that carry on to the present day. Oklahoma is often included; it was not a state, but all its major Native American tribes signed formal treaties of alliance with the Confederacy. The  or all the slave states before 1860 (which included the newer states of Kentucky, Tennessee, Alabama, Florida, Mississippi, Missouri, Arkansas, Louisiana, and Texas). Alabama, Mississippi, Florida and at times Maryland and Delaware. 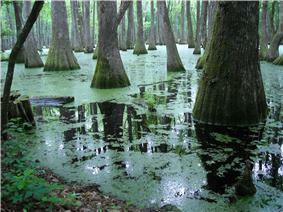 Mississippi embayment areas of Arkansas and Tennessee, and northern and central Florida). The Upper South: Kentucky, Virginia, West Virginia, Tennessee, North Carolina, and occasionally Missouri, Maryland, and Delaware. The Mid-South: Various definitions, including that of the Census Bureau of the East and West South Central United States; in another informal definition, Tennessee, Arkansas, Mississippi, and sometimes adjoining areas of other states. Border South: Missouri, Kentucky, Maryland, and Delaware were states on the outer rim of the Confederacy that did not secede from the United States, but did have significant numbers of residents who joined the Confederate armed forces. Kentucky and Missouri had Confederate governments in exile and were represented in the Confederate Congress and by stars on the Confederate battle flag. West Virginia was formed in 1863 after the western region of Virginia broke away to protest the Old Dominion's joining of the Confederacy, but residents of the new state were about evenly divided on supporting the Union or the Confederacy.